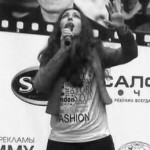 Kristelle took part in the Gala Concert of ‘Student Spring-2013’, which opened an opportunity for her to pass to the next round — city contest, which will take place on April, 23rd. which opened an opportunity for her to pass to the next round — city contest, which will take place on April, 23rd. 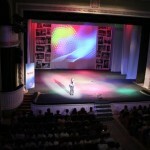 The city Gala concert of the ‘Student Spring’ of this year will take place in Tambov Drama Theatre – for the moment the main stage of the city. Kristelle will be taking part in the ‘Student Spring-2013′ Gala Concert on the 15th of April. The main task of such a contest can be defined as a support of creative initiatives and a search for the most talented young people. It’s not without a reason, the organizers of the festival say: ‘There are very many talented people, and it’s really hard to find a way to them’. Again in March of the current year, the football tournament and the following it concert in the memory of the Russian actor Alexander Dedyushko took place at TSSKA Ice Palace in Moscow. Kristelle performed with the authorial song of Andrew Pronin – ‘Say Good-bye’.